This morning on the way to school, the DJs were talking about a friend of theirs and what a great life she was living. Because of a terminal illness, she had recently been given about a year and a half to live and was working hard to make the best of the time she had left. One of them said it was like she had set a timer and knew she had so much stuff to do before her time ran out. I’ve often pondered that age old question of whether you’d want to know when you’d die if the ability to do so existed. On one hand, you’d be able to do the things you’ve always wanted to do because you’d know just how numbered your days were. On the other you’d might spend each day fretting, realizing your time was quickly fleeting. Well, folks, the truth is… your timer has been set. Your days are numbered. And while there’s no way to know exactly how many you have left, when this one ends, you’ll be one day closer to that timer ringing. On the same program, they were talking about a philosopher named Alan Watts. I didn’t catch much of what they were saying about him. I was in drop off line at school and was trying to pay more attention to my sweet boy than the radio, but I caught his name and looked him up when I got to the test kitchen this morning. Admittedly, I know very little about his philosophy except for one idea that caught my attention. We hear so many times that when we consider life, it should be about the journey, not the destination. And while there’s some truth to it, Watts argues that it’s not really about the journey either. The journey – the travel – is really always about getting to wherever we’re going. And we’re constantly creating quicker, more efficient ways to get there so we can enjoy more time wherever “there” is. Most trips are really more about the destination than the whole “getting there” thing. So thinking of life as a journey isn’t really the right analogy. Watts suggests that we look at life as if it were music or dancing. It’s not about getting through it, it’s about enjoying it while it lasts. We don’t play a song and hope it rushes through to the end. We don’t pick a spot to end up at when we’re dancing and work our way to get there. We enjoy each of these things as they’re happening. We take them in. We listen and step with intent. Music is an experience. Dancing is an experience. They aren’t tasks to accomplish a goal. They’re about the acts themselves. Again, your timer has been set. Are you going to rush through life to get to the end or are you going to enjoy each and every note and step on the way. When the timer rings, what’s left? Start the music. Take the first step. 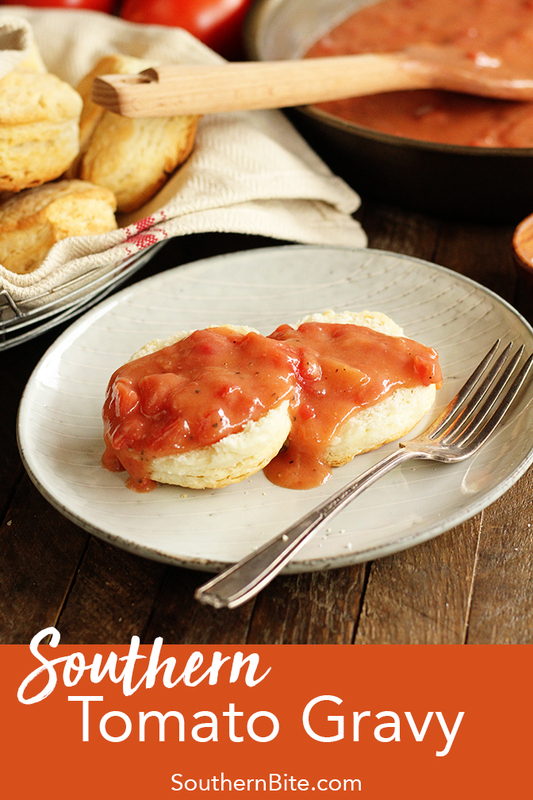 Tomato Gravy has always been a breakfast staple in my family. I can’t count the number of times I remember hearing that pop as my mom would open a jar of my grandmother’s homemade canned tomatoes to make it. 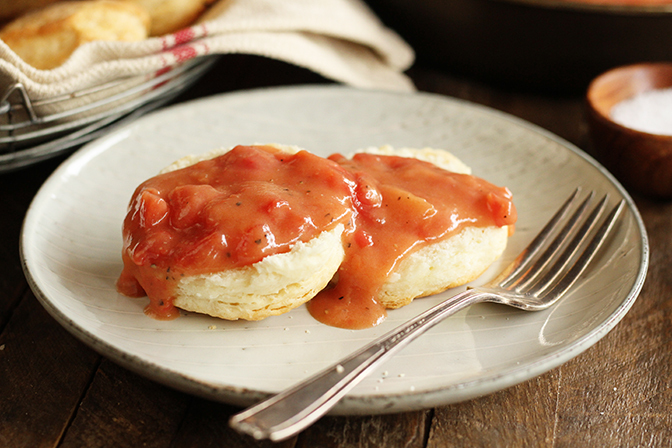 The tangy, savory topping is perfect for homemade biscuits, scrambled eggs, you name it!. I even love it poured over cheese grits – think shrimp and grits, too. And while you don’t have a stock of my Nana’s canned tomatoes, I’ve fixed this recipe up where it will work just perfectly with a can of tomatoes from the store. Y’all enjoy! In a skillet over medium heat, whisk the flour into the warm fat. Cook, stirring constantly, until the flour just starts to brown and smells nutty. Slowly whisk in the chicken broth and stir until smooth. Add the undrained tomatoes. Add salt and pepper to taste. Cook until thickened - about 5 minutes, stirring very frequently. 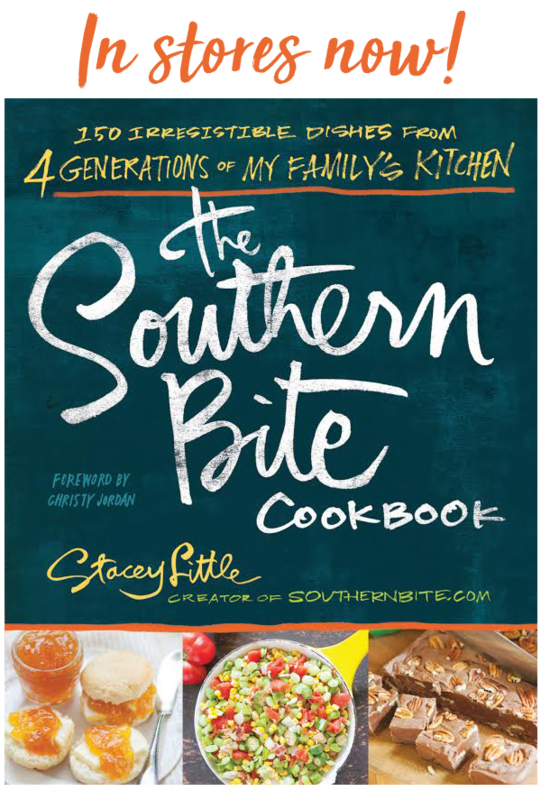 Serve hot over biscuits, grits, etc. You can substitute about 5 to 6 fresh diced tomatoes for the canned tomatoes in this recipe, but may need to add some additional chicken broth to reach the right consistency. My mother never thickened her tomato gravy. It was just sauteed onion and green pepper in a little bacon grease and the can of whole tomatoes went in and were broken up. That was served over rice. She has been gone since 2003, but boy can I remember her cooking. She was a great cook. I know this as creamed tomatoes and I eat it at breakfast over toast. Made tomato gravy with my grandmother everytime we were having hot sausage patties for breakfast. 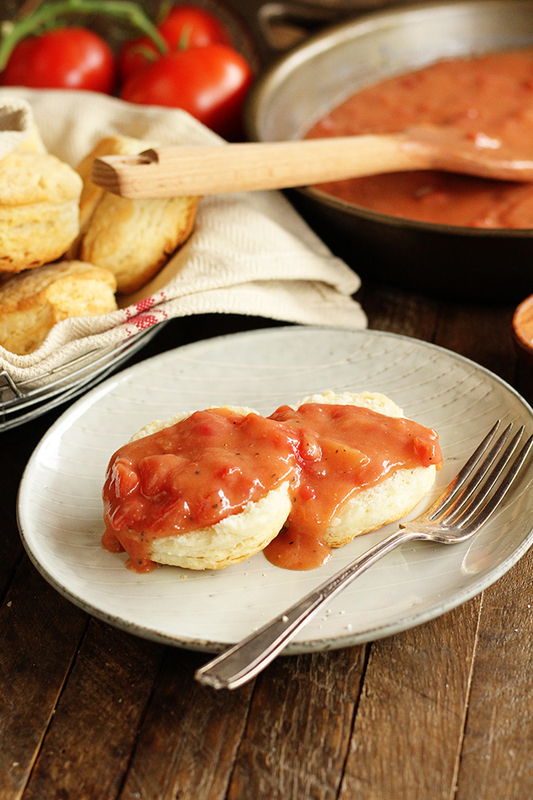 The sweet tomato gravy with the savory sausage served over homemade buttermilk biscuits is a feast. Brings back wonderful memories of another lifetime over 50 years ago. Thanks for sharing that sweet memory! “Again, your timer has been set. Are you going to rush through life to get to the end or are you going to enjoy each and every note and step on the way. When the timer rings, what’s left? Oh goodness. This resonated so strongly with me that it brought tears to my eyes. Thank you for sharing this. And thank you also for the recipe. Thank You for this post. I just turned 57 recently and am having a hard time with the “aging” thing. Had a lot of loss in family and friends in the last few years and this really helped. It’s ALL in God’s time. I’m so happy to hear my words helped. The truth is that our lives are quickly flying by regardless of how we look at it. We’ve got to make the best of each day. 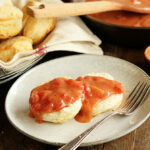 We always had/have tomato gravy over corn bread with our evening meal. Always a favorite with black eyed peas and fried potatoes. Thank you Mom for teaching us the greatest gravy ever! It’s just hard to beat and it’s good on everything! Oh my goodness, now that just sounds absolutely delicious!!!!! One of my favorite meals is navy beans seasoned with some ham, fried potatoes with onions and homemade biscuits!!!! My mom usually cooks that for my birthday every year and it’s always the best!!!! I think this gravy would be the icing on the cake to go with my birthday meal though!!! I also love black eye peas too, so your meal sounds just as great!!!! If you like black eye peas as much as I do, give this soup a try and add a can or 2 of diced tomatoes, it’s one of my favorite soups and it’s delicious!!!! I always have it with meatloaf and put it on the mashed potatoes. I grew up on tomato gravy, and my daughter will not eat tomatoes, but loves tomato gravy. In fact, even brought she is 42, she would be highly upset if we don’t have biscuits, tomato gravy, and bacon for Christmas breakfast! Mother made it with home canned tomato juice if we had it. If not, I’ve seen her use it with tomato paste and water. I make it with tomato juice from the store, but it doesn’t have the acid kick of fresh tomatoes and is more concentrated, so I add water to thin it some and a dash of vinegar. My aunt made it with diced fresh tomatoes. No matter how you make it, tomato gravy is awesome!!!! I couldn’t agree more! Thanks for sharing, Charlotte! 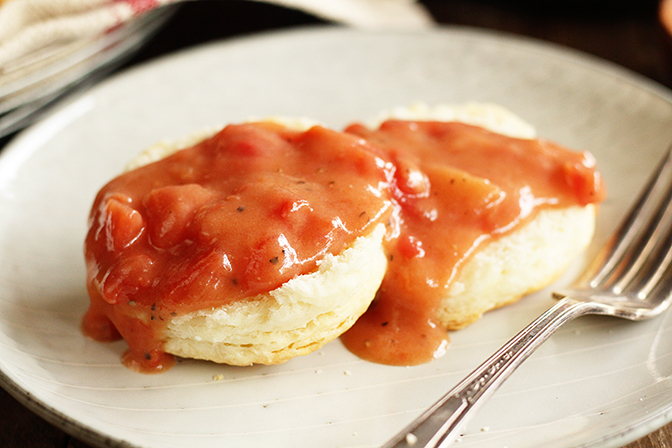 Tomato Gravy is a welcome family treat that we had every Christmas morning. I love it so much! My mother in law gets up early on Christmas morning to make sausage & sausage gravy, country ham, deer steak and gravy and tomato gravy. All with boiled eggs, biscuits and cooked apples from her tree! I have always wanted to know how to make it. Thank you very much! If you really like a sweet spice ham gravy just like my mom made every year at christmas time was the absolute best. Mom grew up in bavaria.so this is a great recipe. First you take a good amount of ham drippings. If you want sweeter add small amounts of fruit punch and brown sugar. You can serve this on your ham and its a fantastic gravy for your mashed potatoes. You stupid b****. What does this have to do with tomato gravy? At least have a button to skip to the recipe. Nobody wants to hear about your early morning musings, or wants to skip over them to get to what they’re really looking for. I’m so sick of people turning recipes into f*****g blog posts. Oh, Sam. You’re true character is showing. And it doesn’t look very good on you. I’ve censored your language – because we have nice folks and kids around here that don’t need to be subjected to that – but have left your comment so the rest of the world can see how you talk to folks you give you free recipes. And FYI: It’s my blog – that’s right, I said blog – and since you’re not paying to be here, I’ll do and share just how I please. Hope your day gets better from here on out! Stacy, love the written out recipe for this. My mother made this for us when we were growing up, for breakfast or dinner. She added the cooked bacon broken up in it too. She also added onions cooked into the tomatoes. We had it over toast. I have tried to re-create the way she made it, never quite right. This did the trick! Thanks! So glad you enjoyed it, Annette!! The bacon sounds like a great addition!! I enjoy your recipes and was delighted to see your tomato gravy recipe because it brought back good memories of my father-in-law making Sunday morning breakfast. He always cooked fatback and used the grease rendered from that as the oil for the tomato gravy. He didn’t use chicken stock/broth, but he used home canned tomatoes and he always added about 1/2 cup or so of beer as the gravy simmered. Several years back while on vacation, my husband and I ate at a restaurant outside of Myrtle Beach. We had what was basically a low country boil for two and it was served with garlic bread and a “secret dipping sauce.” At first bite of the garlic bread dipped in the sauce, my husband remarked, “This tastes like something I’ve had before.” I responded, “It’s your dad’s tomato gravy!” We were pleasantly surprised to have it and I now make it as a dipping sauce for garlic bread on occasion, as well as making it for breakfast. 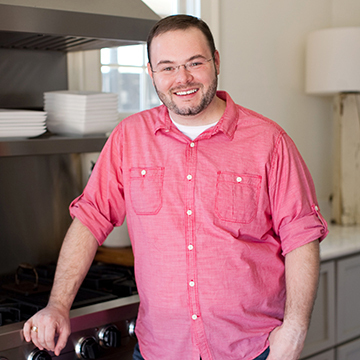 Thank you for your blog and for the delicious recipes that you’re willing to share with us! Thanks so much, Vickie! And thanks for sharing that story! Is it okay to substitute water for the chicken broth or will it be kinda blah? Thank you for sharing the recipe I will give it a go and see if I can get it right lol! You can. I know many folks who only use water. I just like the additional flavor that the broth adds.